It′s official. Our whole family has moved to the country. The pets are disturbed and restless. My sisters are disturbed and restless -- although that′s normal. What is not normal is a cursed fox and a haunted clubhouse. That is definitely unnormal. At least the country people now have an expert in their midst. Someone with a cool head and a sharp eye. Someone who can solve intriguing mysteries and knows how to keep detailed Secret Spy Files. Really, it′s lucky I came along when I did. Tan is the youngest of four girls in her family. Her sisters are referred to as the traffic lights, or lollipops, due to the colourful nature of their names, Ruby , Emerald and Amber. Their father is a vet and their mother a foodie journalist, and they are moving to the country with their menagerie of animals. As you can imagine the sisters are all quite unique, and like any family they annoy each other and keep each other company in equal measure. Some elements of moving to the country are great, the space, the exploring, a tree-house, but things like dead foxes, having to start a new school, and try to make friends are not so nice. 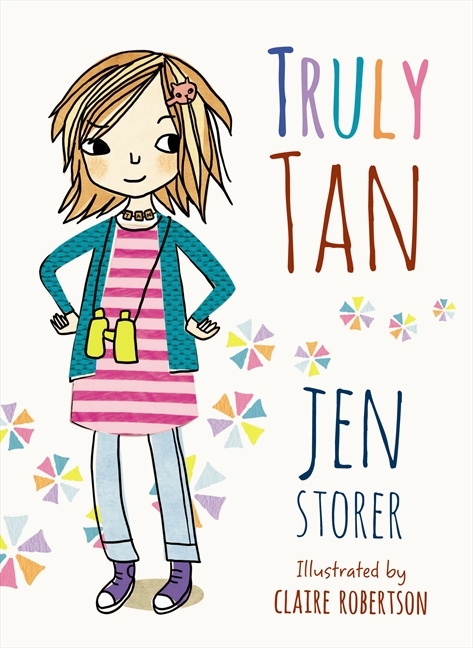 Tan goes through the process of trying to find her way to ‘poularness’, figuring out who is already best friends with who, and hopefully finding a friend who may share her sleuthing ways! As well as the Callahan family, the other characters in this story are Ted and his sister Jem. They are neighbours, and the owners of the Purple Haunt (the PH), an amazing two roomed cubby with a verandah and it’s own ‘drop dunny’. The Callahan girls are among the privileged few to be invited in to the inner sanctum of the PH, and they are invited to become members of the Chosen Few. Strange goings on at PH, suggest that the story about Wandering Wanda, who lived not far from the PH, may not be stories at all. The Chosen Few are certain that Wandering Wanda is haunting them, and the only way to find out why is to go and visit her abandoned house and look for clues. This book has humour, mystery, a ghost, torches (trust me they feature a lot! ), dogs, annoying sisters, nice sisters, interesting new friends, a little bit of sleuthing and a lit of really yummy food!